The British Sovereign has one of the longest histories of any running series. It dates back to 1817, when the coin debuted with an image of King George III on the obverse and a shield and crown motif on the reverse. The reverse image was later replaced by what is considered a classic design of Saint George slaying a dragon, the same design that the coins in this set share. Each coin produced in the series, which ran from 1817-1918, again in 1925, and from 1957 to the present, has been produced according to the purity standards set forth in the Act of 1816. Even the weight of the full sovereign remains relatively constant at 7.988052-g, which was rounded to 7.98805-g by the Coin Act in 1971. Today, that tradition is alive and well with this latest issue of the series. THE LATEST IN A CENTURIES-OLD SERIES – This coin is part of the latest issue in one of the world’s oldest continuing series. This coin is perfect for those who love rich history in numismatics. 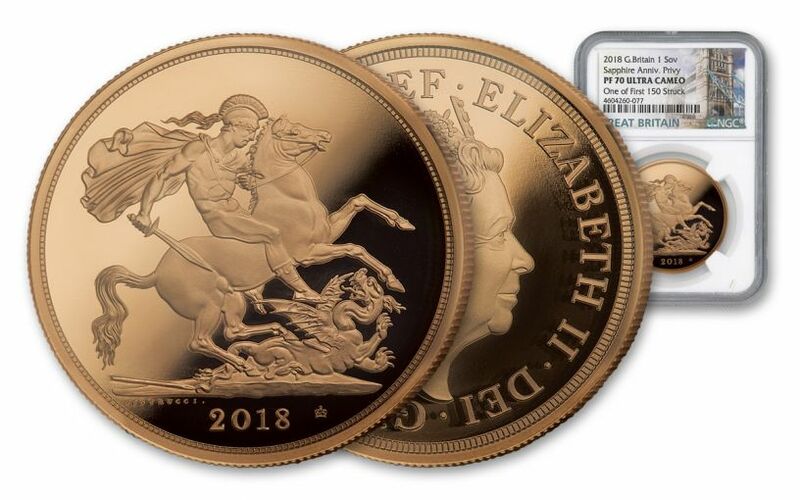 GORGEOUS PROOF FINISH – This £1 Gold Sovereigns has a beautiful proof finish that makes both designs stand out. The coin was struck from approximately ¼-oz o .917 fine gold. 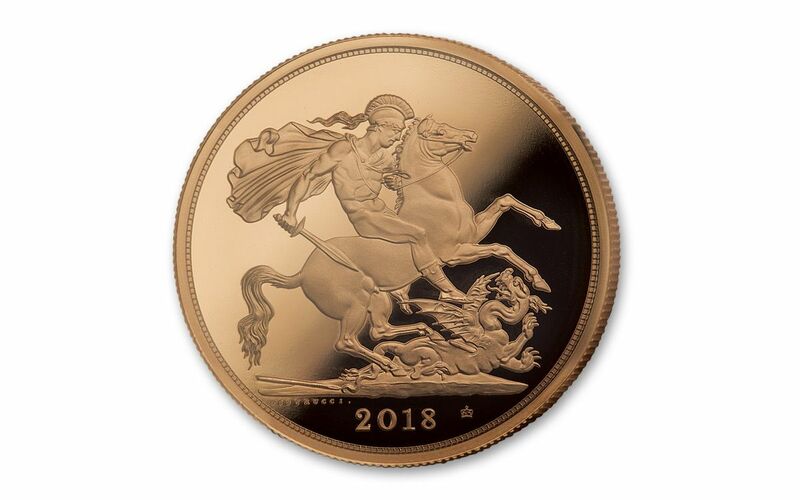 BRITISH LEGAL TENDER -- Each 2018 Sovereign is £1 legal tender in Great Britain. Britain and the United States have what has become known as the “Special Relationship” for the past century. The two countries remain among the most closely allied on the planet. 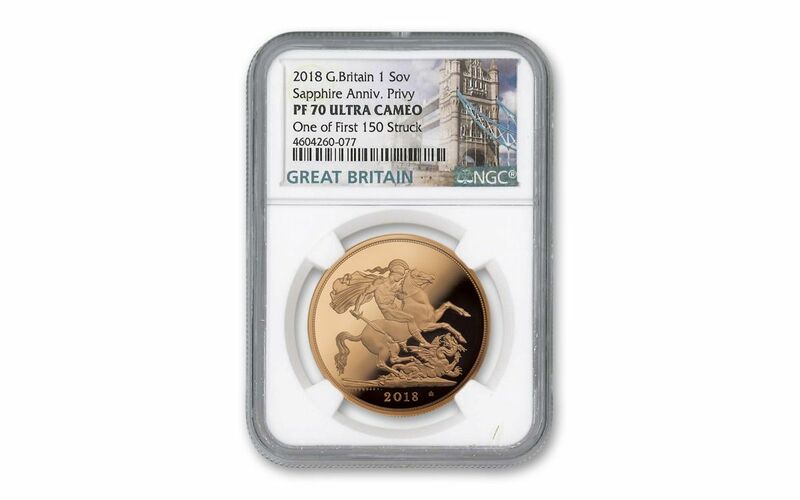 CERTIFIED AS FLAWLESS BY NGC -- Your coin will be certified Proof-70 Ultra Cameo (PF70UC) by Numismatic Guaranty Corporation (NGC), a distinction that means your perfectly-graded proof will have ZERO imperfections -- showing all features and fields exactly as the engraver and mint intended! 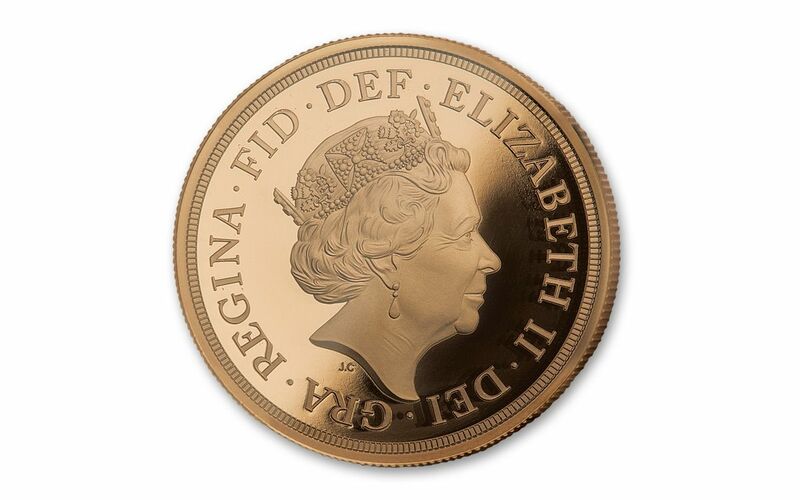 FIRST 100 COINS – This coin was certified as a First Strike, which is made possible by the fact that GovMint has an annual tradition of a deal with the British Mint that gives us access to the first hundred minted. A LIMITED MINTAGE – Just 13,350 of these coins were authorized. The British Royal Mint is among the most highly respected mints in the world. In fact, over fifty foreign countries entrust their minting to it. Its millennia-plus continuous history included the service of Sir Isaac Newton, who served as Mint Master for nearly three decades, bringing his knowledge and skill to bear on Britain’s coinage. This set continues what many consider Britain’s most historic and important collections. Act now, because this classic coin will not be available for long!